Make sure to turn the water supply off at its source. 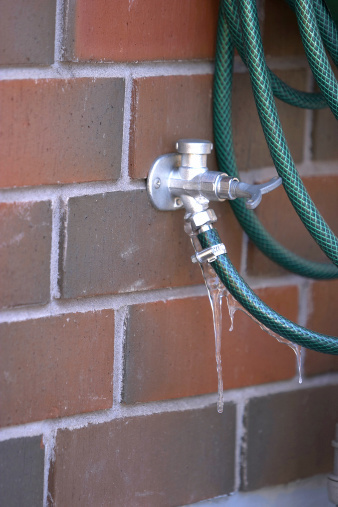 The main shut off valve for your irrigation system should be freeze-proof: below the frost line, inside a heated room or wrapped with insulation to protect it. all of our readers. In fact, it may affect only a few, but for those of you facing freezing temperatures in winter, four simple steps should help to protect your irrigation system. Turn off the water supply at its source. The main shut off valve for your irrigation system should be freeze-proof: below the frost line, inside a heated room or wrapped with insulation to protect it. Make sure the controller is off. Most controllers have a “rain mode” which simply shuts off the signals to the valves, while continuing to keep time. If it’s necessary to shut off the power to the controller, remember to reprogram it in the spring! If a pump is wired to your controller, it is recommended that you disconnect the power rather than use the rain mode feature, as there is a remote possible that the controller could accidently start the pump while the system is shut down, resulting in damage. Open every valve manually. You risk bursting a pipe or sending sprinkler heads flying when you send compressed air through the system, if every valve is not completely open. Drain the pipes. Remember those science experiments? Water will always seek the lowest level. Even if you have opened the valves and turned off the water supply, and water remaining in the system will pool at the lowest point(s) in the system. There are three approaches to draining the system of standing water: open the drain valves, pull the nozzle off each individual spray head or use compressed air to “blow out” the system. A combination of all three is the recommended process. But it’s the introduction of the air compressor where the expertise of a professional is preferred to the “do-it-yourself” method. Too much pressure and you will damage your system.